The Trump administration has been promising they would respond to any charges by Robert Mueller with a devastating point-by-point defense: a “counter-report” written by none other than attorney at law and esteemed cybersecurity expert Rudy Giuliani. Let’s check in on the progress of the response. Actually, “progress” does not seem to be the appropriate term. More like the opposite of progress. On July 30, USA Today first divulged the coming counter-report. 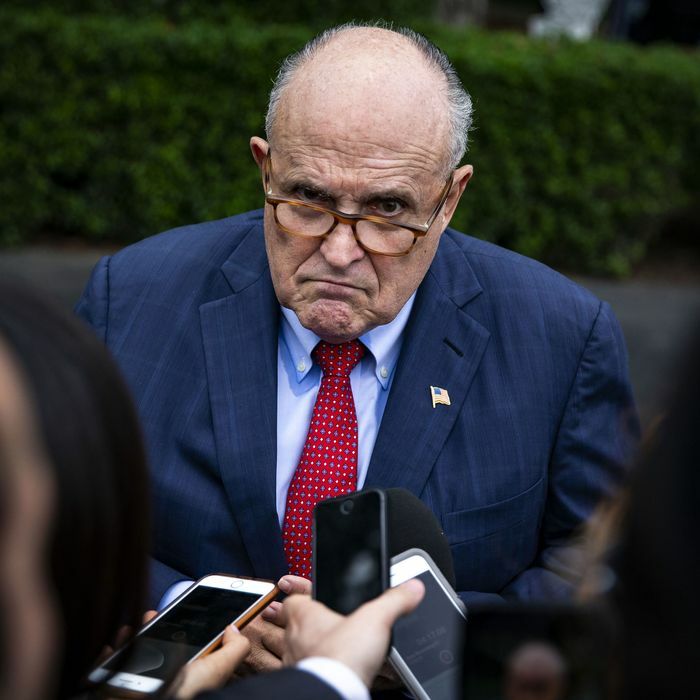 “Giuliani’s own team worked on its ‘counter-report,’” the story noted, “which he said would be released after his team reviewed whatever Mueller filed with the Justice Department,” which he expected to occur by September 1. That gave Giuliani less than a month to finish. A profile of Giuliani in The New Yorker, published September 10, included another counter-report update: “Giuliani said that this ‘counter-report’ is already forty-five pages and will likely grow, adding, ‘It needs a five-page summary—for me.’” Note that just a couple weeks before, the first half alone had stretched to 58 pages, but now the entire thing was just 45 pages. This was perhaps a sign that the report was not proceeding quite as fast as promised. Today’s Atlantic reports on the state of the administration’s overall response to Mueller, which is as shambolic as one might expect. The numerous difficulties include the fact that nobody is willing to face up to the actual guilt of everybody involved (“There have also been few frank conversations within the White House about the potential costs of Mueller’s findings, which could include impeachment of the president or the incrimination of his inner circle”) as well as the president’s characteristic inability to follow any plan at all. But it also contains a brief reference to Giuliani’s counter-report, the centerpiece of the entire strategy. He’s been furiously compiling it since July. How’s that report going, Rudy? Giuliani said it’s been difficult in the last few months to even consider drafting response plans, or devote time to the “counter-report” he claimed they were working on this summer, as he and Trump confronted Mueller’s written questions about the 2016 campaign.